SKY LIGHTS – The only good night lights are billions of miles away. I wrote about iridescent clouds on another occasion. At least I thought I did — in that post I misidentified a circumhorizontal arc as an iridescent cloud. 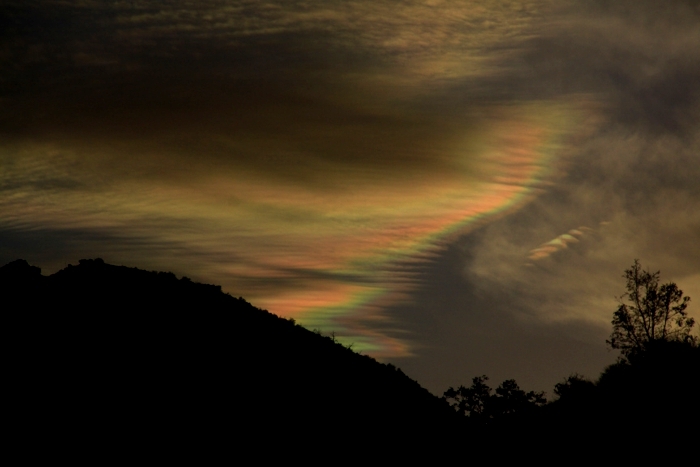 Both produce colors via the same mechanism, but not all iridescent clouds are circumhorizontal arcs. The arc in that link was photographed by Roger Serrato, a fellow astronomer and skilled photographer. The images in the slideshow above are also courtesy of Roger, and these are definitely not circumhorizontal arcs. Photo specs: Canon 50D, 1/1000 sec, f/11, ISO 100. The location was Mt Lemmon, in southern AZ. The date, March 22, 2019, around sunset. The colors in an iridescent cloud come primarily from diffraction. Visible light contains wavelengths from 380 nm (violet) to 750 nm (red), where 1 nm (nanometer) = 1×10-9 m. If water droplets (or ice crystals) in a cloud have a mix of diameters spanning that range, all the colors of the spectrum can be separated. If the cloud is thin enough, those colors can escape to reach your eye. It’s much like what happens on the surface of a soap bubble or oil slick. By comparison, the colors seen in a rainbow are separated by the process of refraction. The Law of Diffraction takes many forms, but for iridescent clouds it comes down to this: Light waves will most strongly scatter when their wavelengths are smaller than the size of the water droplet (λ < D). 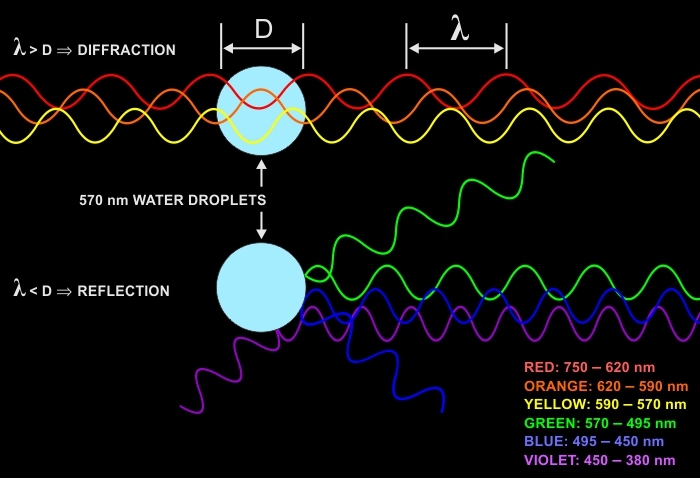 When their wavelengths are larger than the water droplet (λ > D), the waves diffract around the droplet as though it wasn’t there. You’ve probably experienced the equivalent effect with sound waves. When arriving at a party where music is playing, you always hear the long wavelength bass notes from afar, around obstacles and corners, and through shrubs and fences. But the shorter wavelengths of the melody are discernible only when you’re near the performance. The graphic below shows this effect for water droplets with diameter D = 570 nm, midway through the size range of visible wavelengths (λ). Depending on the size of the water droplets, the diffracted and reflected colors will peak at various points in the visible spectrum. Individual colors in the graphic are shown separately for clarity. In reality, incoming and outgoing waves of all colors overlap and blend their hues, producing that beautiful pastel palette. The curious reader may wonder why refraction doesn’t also occur, as it does in a rainbow. The falling raindrops that create rainbows are much larger (D ≥ 100,000 nm), but it’s still white light impinging on water droplets. According to the Law of Diffraction all the colors should reflect since λ <<< D. Yet in a rainbow the waves enter the droplet and refract to disperse their colors. Why the difference? It really comes down to this: At the nanometer size scale, light behaves less like a particle and more like a wave. Quantum uncertainty comes into play and prevents light from following the clearly defined paths of refraction shown in rainbow ray diagrams. 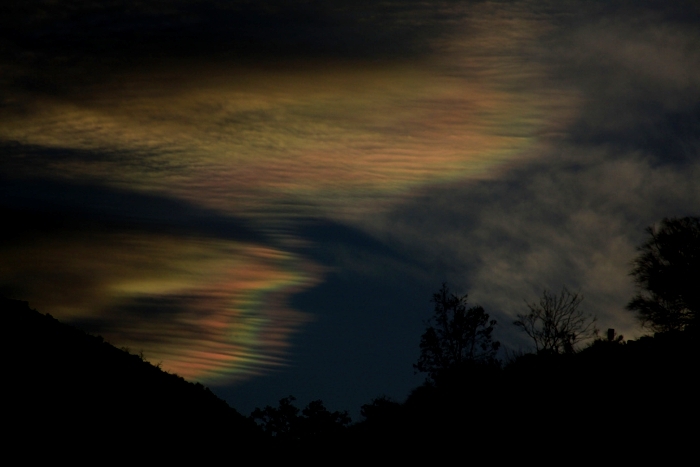 Macroscopic observations of quantum phenomena are rare, and iridescent clouds are one of the few easily accessible examples. So next time you see an iridescent cloud, consider it a privileged view into the quantum realm. The Sun need not be directly visible to see iridescent clouds, but if it is, their visibility and contrast can be dramatically improved by standing in the shade. Once the Sun is blocked out, you might even see iridescent clouds you didn’t notice before. Polarized sunglasses can also help. What makes iridescent clouds so rare are the atmospheric conditions needed to produce these microscopic water droplets. An “average” cloud has droplets on the order of 1000–100,000 nm — many times the size of even the longest wavelength of visible light, so they reflect all colors. This is why clouds are generally white. To get droplets small enough for iridescence, you need strong updrafts, high wind shear, or just the right combination of temperature and humidity. 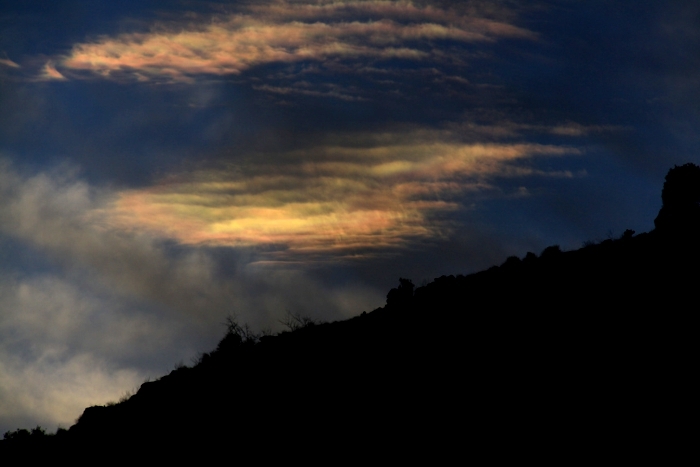 Iridescence is more clearly seen when the clouds are thin, but is sometimes visible along the sunward edges of thicker clouds.